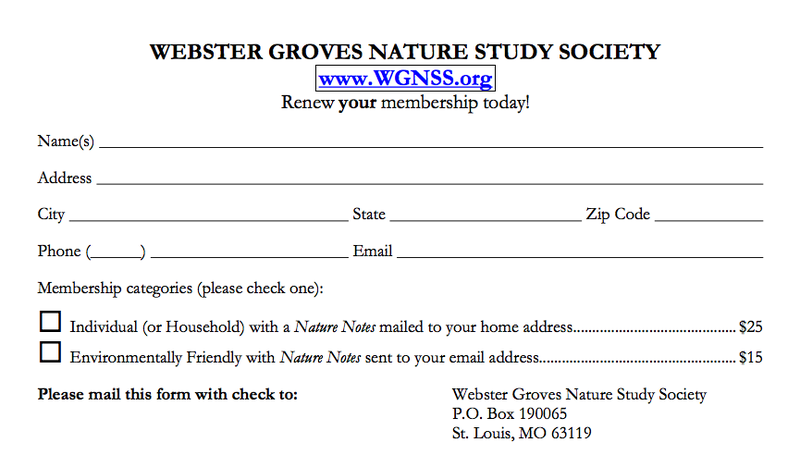 Founded in 1920, Webster Groves Nature Study Society focuses on experiencing nature. Join WGNSS for birds, bugs, & botany! All events are free & open to the public, unless noted. The city of Webster Groves, Missouri, is one of the oldest suburbs of St. Louis. Shortly after World War I, citizens of Webster Groves and members of various garden clubs were invited to a meeting by Alfred F. Satterthwait to form an organization to study nature. The result was the formation of the Webster Groves Nature Study Society in 1920 with 85 adult and 30 junior members. The society--usually known as "WIG-NESS"--has grown to become the principal organization of amateur naturalists in the St. Louis area. For historical reasons the name has remained unchanged, although there are about 400 members scattered throughout the St. Louis area and several states. The main interests of the original assemblage were entomology, botany, and ornithology, and groups with these three interests still form the core of the organization. However, several other groups have been active at various times, depending upon the interests of the members, in subjects such as astronomy, geology, and herpetology. More recent additions are Nature Book Club and Bryology. Each group has regular field trips and meetings, and the Society at large meets monthly to enjoy lectures by guests or members knowledgeable in diverse aspects of nature. General meetings are held once month, September through April, at 7:30 PM at the Webster Groves Public Library, 301 East Lockwood Ave., 63119. Each year, we sponsor 3 scholarships for students. In early May, we hold our annual dinner, featuring a speaker and a display of nature photography and art work by our members. In 1930 the Society started a journal, Nature Notes. Over the years, hundreds of members have contributed their observations, knowledge, and personal experiences to the publication. Announcements and reports of meetings and field trips are regular features. The stated objectives of the Society are "to stimulate interest in nature study on the part of adults and children, to cooperate with other organizations in nature study, and to encourage amateur research in the natural science." In keeping with these objectives, field trips and meetings involve the exchange of knowledge between experienced and inexperienced members. Interaction between amateurs and professionals is encouraged. The Society contributes research scholarships to college students. Other activities include the coordination of two Christmas Bird Counts for the National Audubon Society. The WGNSS has 501(c)(3) status with the Internal Revenue Service and is registered with the Missouri Secretary of State as a benevolent organization, charter number B00009096. Click here to download the WGNSS 75th Anniversary History, published 1995.